We bought the house and before I moved in I refinished the hard wood floors and Patrick remodeled the bathroom. More on that later. Saturday night I was putting things away in the basement and I had had it. The carpet downstairs HAD to go. The picture does not do it justice. It was red/orange/brown/yellow. 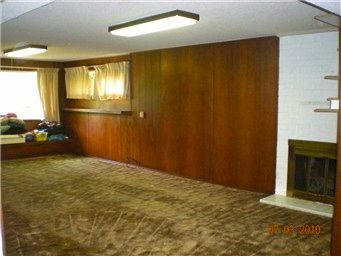 I honestly don't know what color the original carpet was. It was no longer stretched, it was damp in places and I won't even go into the smell. I wanted to be able to watch TV without feeling like I might catch a rash. I wanted to walk downstairs without shoes on. Sunday morning I talked with Patrick and we decided the carpet was a must do ASAP project. Sunday night we made an appointment for the carpet people to meet us at the house Monday evening. Oh stop judging me. No one had to work. We made the appointment online so the Sabbath was still Holly in this house. Monday the carpet people came and today WE GOT NEW CARPET. 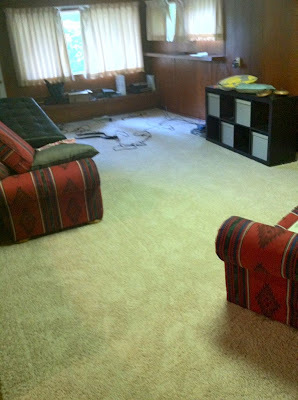 It still smells, but it's new carpet smell and that WILL go away. I can safely walk barefoot and in fact just did! No more mystery science project growing in the basement. Now if there are any stains I'll be able to tell you exactly what they are from. - oh that over there, I tipped over my Diet Coke as I was reaching for more yarn to crochet with. Now to deal with the worlds ugliest couches that came with Patrick. Again I have so much to catch you up on. To give you a sneak preview, just know those couches involve a loose cushion and a freeway search and rescue. ugly couches are a rite of passage in the newlywed world. three cheers to carpet that won't give you a rash! believe me, i completely understand where you're coming from on that one. Richard says "the Sabbath is always 'Holly' in my house." Good decision on the carpet! Had to be done, that's all there is to it! Are you speaking of the native American print couches in the after pic...? Congrats on the house!